Petr Konchalovsky, The Game of Billiards. Aristarkh Lentulov and Petr Konchalovsky, 1918. Estimate: £1,500,000 to £2,000,000. LONDON.- Museum quality works with great provenance lead MacDougalls November 2018 auction of Important Russian Art. 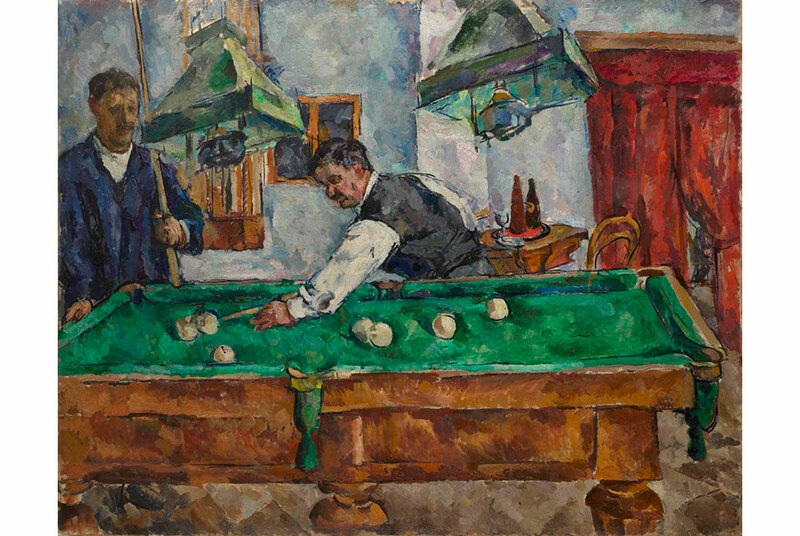 The 1918 Petr Konchalovsky The Game of Billiards. Aristarkh Lentulov and Petr Konchalovsky, is estimated at £1,500,000 to £2,000,000. It is an iconic painting from one of the leading European collections of Russian art, which has never been previously offered at auction, making this sale a true sensation. The work depicts Aristarkh Lentulov and the artist himself, founders of the famous Russian avant-garde group Jack of Diamonds and both among the leading artists of the 20th century. The Game of Billiards. Aristarkh Lentulov and Petr Konchalovsky, on the par with the best Konchalovskys paintings at the State Tretyakov Gallery, belongs to the painters supreme achievements from his most acclaimed Jack of Diamonds period. The work has been exhibited numerously, twice in the Tretyakov gallery, The State Russian museum etc. Another work of exceptional quality to be auctioned, Boris Anisfelds The Garden of Hesperides (estimate £300,000400,000), is from an equally famous European Russian art collection. Painted in 19141916, this Symbolist composition belongs to the most important period in the career of the outstanding Silver Age artist, when he achieved European fame with his stage designs and colourful fairy-tale extravaganzas, adorning the collections of the Tretyakov Gallery and the Russian Museum. The Garden of Hesperides is among the best of them. The forthcoming auction will include an elegant 1922 Portrait of the Violinist Cecilia Hansen (estimates £400,000600,000) by Ilya Repin, featuring a famous musician and the artists close friend. Unlike Konchalovskys work that illustrates an important time of historical changes, Repins canvas raises the eternal subject of combination of great talent with femininity. Master of characters and souls, Repin delicately depicts Cecilia with warm affection and understanding  an effect perhaps only he could achieve so exquisitely. The piece comes with distinguished provenance having once been in the collection of the artists daughter. A piece presented at auction for the first time and boasting remarkable provenance is Silvestr Schedrins Moonlight over Naples (estimate £450,000-600,000), a delicate and elegant progression of the artists intrinsic understanding of romanticism. Featured in the most important museum collections including the State Russian Museum, Tretyakov Gallery, the Naples series is emblematic of the artists incontestable mastery. The work presented for auction is one of the earliest works in this series and arguably one of the most important ones. Moonlight sinking in the distant horizon, frail, fragile lights and remarkable attention to detail not only showcase the artists skilfulness but bring more soulful notes into the painting, making one think of something broader  more meaningful and infinite. The auction will also feature works by Isaak Levitan, Lev Lagorio, Konstantin Korovin, Boris Grigoriev, Natalia Goncharova, Martiros Saryan, Konstanin Gorbatov, Igor Grabar, Yuri Pimenov, Vasily Sitnikov, and Ilya Kabakov among others.